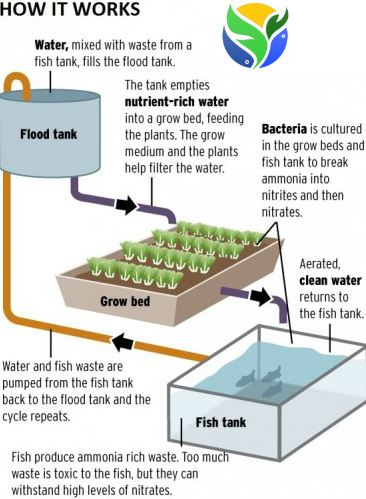 Are you wondering “what is Aquaponics?” The most simple definition is that it is the marriage of aquaculture (raising fish) and hydroponics (the soil-less growing of plants) that grows fish and plants together in one integrated system. The fish waste provides natural food source for the growing plants and the plants provide a natural filter for the water the fish live in. The third participants are the microbes (nitrifying bacteria) and composting red worms that thrive in the growing media. They do the job of converting the ammonia from the fish waste first into nitrites, then into nitrates and the solids into vermicompost that that are food for the plants. In combining both systems aquaponics capitalizes on the benefits and eliminates the drawbacks of each. The strength of this mixture needs to be carefully monitored, along with pH, using expensive meters. In aquaponics you carefully monitor your system during the first month, but once your system is established you only need to check pH and ammonia levels occassionally or if your plants or fish seem stressed. Hydroponic systems are prone to a disease called “pythium” or root rot. This disease is virtually non-existant in aquaponics. And Aquaponics is proven to be even more productive than hydroponics! Waist-high aquaponics gardening eliminates weeds, back strain and animal access to your garden. Gardening chores are cut down dramatically or eliminated. The aquaponics grower only does the enjoyable tasks of feeding the fish and tending and harvesting the plants.